Hal takes a break and celebrates, as SUN TIME reflects its surroundings. 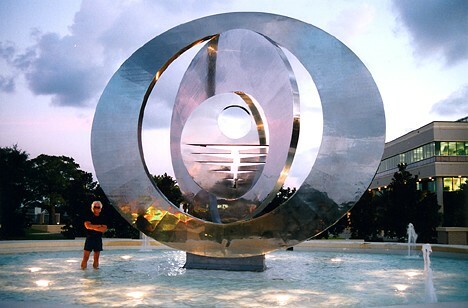 "I hope the Sculpture, as it reflects its surroundings and interacts with the passage of the sun and moon, and the great Florida sky with its sunsets and ever-changing 'sky mountains,' is uplifting and brings joy to those who experience it." "SUN TIME references planet earth, the sun, moon, cyber space, outer space, and, other than linear time. I was inspired to create this work as a symbol of the great beauty and precise composite balance of these universe elements. 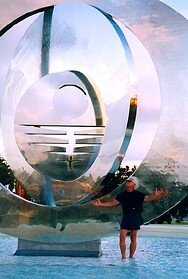 It is my intent that this monumental work reflect humankind's reverence for this critical balance."